A royal Canaanitish town, eastward from Beth-el in the northern part of the territory of the tribe of Benjamin, the seat of a king, destroyed by Joshua (Josh. viii.) after one unsuccessful attack (Josh. vii.). In Josh. viii. 28 it is described as "a ruin unto this day." It must have been rebuilt before the time of Isaiah, as it is mentioned in Isa. x. 28, where the name is given as Aiath. "Men of Beth-el and Ai" are mentioned after the Exile (Ezra, ii. 28); Aija and Beth-el were peopled by Benjamites (Neh. xi. 31). Ayya (as in many Hebrew manuscripts and the better Septuagint manuscripts, instead of Azzah-Gaza), in the latter passage, is a border city of Ephraim, I Chron. vii. 28. Aiath may be understood thus or as the northernmost city of Judea. According to Gen. xii. 8, xiii. 3, Abraham encamped on a mountain between Ai and Beth-el; and in Josh. vii. 11 Joshua's army is said to have pitched on the north side of Ai with a valley between that place and Ai. Ai is generally identified, according to Van de Velde, with the modern Tell el-Hajar, between Betin and Där Diwan; and, according to Robinson, with Khirbet Ḥayan, directly south of the latter. 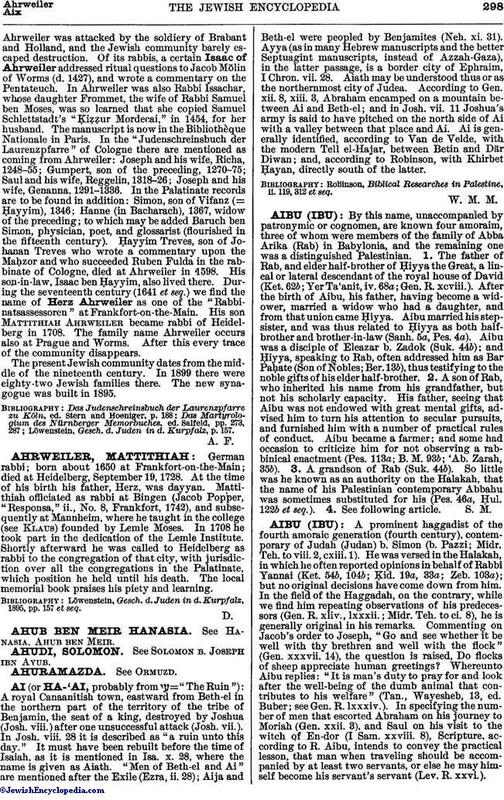 Robïnson, Biblical Researches in Palestine, ii. 119, 312 et seq.